For over 10 years, Blitz Krav Maga’s Instructor Training & Certification program has produced outstanding Krav Maga instructors whose teaching skills and knowledge of techniques are recognized throughout the U.S. and abroad. Each Instructor Training Module (ITM) combines a dynamic mix of instruction in Krav Maga techniques from a teacher’s point of view, teaching practice and theory, class simulations, basic anatomy, and physiology, stretching techniques and basic First Aid. 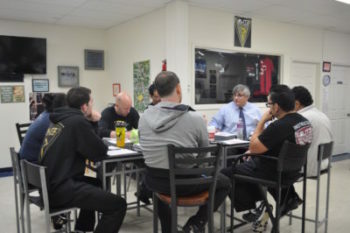 What makes Blitz Krav Maga’s Instructor Training & Certification program the right one for you and your Krav Maga school? The highest standards – before individuals are permitted to register for one of our training Modules, (a) they must have the appropriate pre-requisites; (b) we evaluate their Krav Maga skills and experience; (c) we certify only those individuals who demonstrate, throughout the training Module, outstanding focus, commitment to training, teaching skills, and of course the required Krav Maga techniques. The most up-to-date curriculum – every ITM reflects Blitz Krav Maga’s commitment to one of the most unique and important features of Krav Maga: continued refinement of existing techniques along with the development of cutting-edge techniques for dealing with new self-defense challenges. Outstanding Module instructors – Blitz Krav Maga instructors in each training Module are advanced practitioners, with at least three years of teaching experience, and they have to have received the highest evaluations not only in the ITM in which they teach but in at least one higher level ITM as well. State of the art facility – Blitz Krav Maga’s 7000 square foot training center is fully equipped with everything an authentic and dedicated Krav Maga school should have: a large matted training area, a full range of equipment—pads, shields, training weapons, crash-pads, heavy bags—outdoor and specialized training areas, and much more.